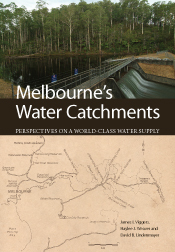 It’s called Melbourne’s water catchments: perspectives on a world-class water supply. It’s available from CSIRO Publishing. The book is an account of the history of Melbourne’s water supply (I bet you didn’t see that coming), from the squalid swamps of the first settlements to the sophisticated system in place today. How have ecological, biological, economic and political pressures affected the water supply over time? What challenges will Melbourne face for water supply in the future? Find out in the book! Wombats: furry, subterranean, and occasionally terrifying. When cold is not cold enough. Show us your spots! Quoll trapping in northern Queensland. Scicomm win: explanatory videos for papers.